Goat and more at El Cabrito and Julia's Mexican eateries. United States immigration policy has been in the news and on our minds for some time now, but has reached a boiling point with the new Trump administration. As someone who has written thousands of reviews, I can't even imagine restaurants in Utah—or anywhere in the U.S., really—thriving without the work of Mexican and other Latin American immigrants. Nor can I imagine our culinary palette being anywhere near as robust and varied as it is without the wide spectrum of flavors immigrants from around the globe bring to our tables. Rose Park's El Cabrito is one such eatery, a place where family members of multiple generations work side-by-side to bring stellar Mexican food and south-of-the-border-style amabilidad to their customers, most of whom seem to be regulars. Cabrito in Spanish means young goat. And in Mexico, there are many styles of cabrito, ranging from roasted al pastor and oven-baked al horno to en salsa (in sauce) and stewed birria. You can't go wrong with goat in any of its forms at El Cabrito, but especially wallet-worthy is the goat consommé called consomé de chivo ($9.99). Most, if not all, dishes are less than $10. On one visit, our pozole, enchilada platter, carnitas taco, tostada, soft drinks and takeout order of carnitas meat totaled around $31. If you're not quite sure about goat but would like to try it, I recommend the enchiladas ($9.99). It's a plate of three large corn tortillas stuffed with tender, shredded, barbecued goat meat, baked and bathed in a rich, dark mole sauce, then smothered with shredded lettuce, tomato and crumbled Mexican cheese. The dish also includes traditional housemade refried beans and Mexican-style rice. 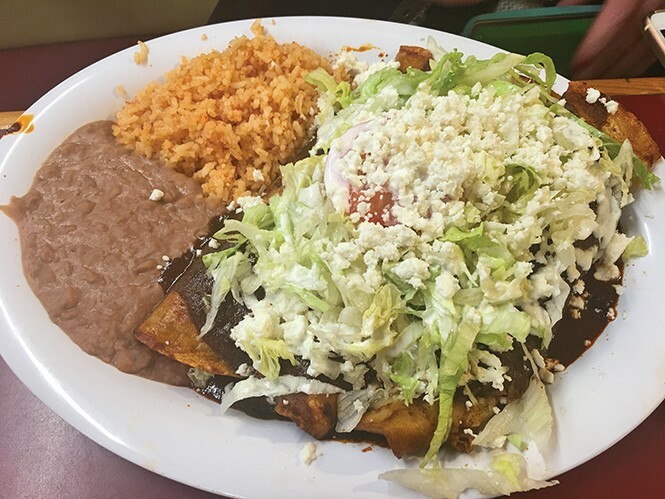 Other enticing enchilada options include lengua (beef tongue), cabeza (beef head meat) and carne asada. One of the things that makes El Cabrito so special is the tortillas. Both the corn and flour versions are housemade, so even the simple tostada that came alongside my order of pozole ($8.99) was wonderful: a fresh, crispy, flash-fried corn tortilla topped with refritos, lettuce, tomato and cheese. The pozole was a "white" version—a huge bowl of shredded pork and hominy in a light, delicious pork broth with fresh tortillas and accompaniments like shredded cabbage, hot sauce and oregano on the side. The portion was so large that it fed me lunch for two additional days. A reader recently reached out to me, asking where he might find a good torta in town. Tortas are sort of a Mexican version of a hero or submarine sandwich: toasted buns typically smeared with mashed black beans and avocado, and stuffed, in the case of El Cabrito's, with choices like chicken Milanese (Milanesa de pollo), carnitas, barbacoa de chivo, cabeza and other meats. Burritos ($5.99), sopes ($4.99) and tacos ($2.25) are also available with the same range of stuffings. By the way, the tacos served here aren't street-size. They're ginormous. One carnitas taco and a side of rice makes for a satisfying meal at less than $5. Oh, and about those carnitas: They're bomb. The ladies in the kitchen slow-roast pork throughout the day and night until it's moist, tender and glistening before chopping and shredding the meat to the consistency of Carolina pulled pork. The flavor is so rich and satisfying that you'll want to buy extra to take home. Well, you're in luck because the nice folks there sell ready-to-eat carnitas meat to take out for a mere $6 per pound—even cheaper than it would be to make at home. For $11.99 you can get a pound of carnitas, plus tortillas, cilantro, onions and limes; add rice and refried beans for an additional $2. The same type of takeout deal is available for the scrumptious barbacoa de chivo, priced at $10.99 per pound (meat only), $15.99 and $20.99, respectively. Initially, someone told me that the staff didn't speak much English at El Cabrito, but that wasn't the case. Servers we encountered were helpful and spoke perfect English. So, don't be deterred if your Spanish isn't too swell. I was bummed a while back to learn that Midvale's El Mana restaurant, one of my favorite spots for goat and other authentic menu items—birria en caldo, birria de res and lamb tacos, for example—had closed. However, not all the goat is gone. I've written about it in the past, but as a reminder: Another excellent eatery where you can get your goat is Julia's in Rose Park. Dining at this cash-only establishment is like having your abuela cooking for you. Doña Julia makes everything from scratch in her tiny kitchen and tends to all customers like they're family. The birria at Julia's is off the hook, and I love all of her hearty stews and sopas and magnificent menudo. But the one dish you don't want to pass up is birria de chivo: young goat marinated in a mild mix of guajillo chiles, garlic, cumin, oregano, onion and other seasonings before it's slow-cooked until toothsome and tender. It's truly great goat.